Very often users especially those involved in project management need to do screen capture and share with other team members for discussion or presentation. An easy to use and powerful screen capture software application will be helpful to facilitate the process. Ashampoo’s Snap 3 is a screen capture software application for users to capture and store the computer screen shots inclusive of video. This application can turn whatever appears on the screen into a snapshot or movie and save it to a file. It features some simple editing functions for users to do simple editing on the screen shots. Ashampoo Snap 3 offers two different modes: Video mode for full-motion movies and Application mode for capturing Windows programs – for example for demos and walk-through tutorials showing how to use a new application. Users are allowed to add voice, add arrows, include text, drop shadows, highlight, etc to explain discuss the screenshots. 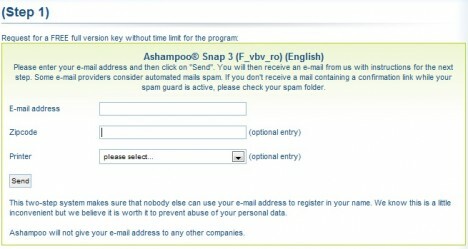 Users who need a screen capture software for work and other purposes are given a chance to download and get a free copy of Ashampoo Snap 3 with full version key without time limit. Users who would like to try this program can go to Ashampoo’s promotional page to fill in a valid email address and send to the developer. Users will thence receive an email with a link that requires users to click and open a new window in a web browser. The new window is the product registration page. Users can fill in their personal profile details to join the Ashampoo community or click on to “Freebie Registration Keys” section to receive the free registration key for the program. Users can download Ashampoo Snap 3 via the link here. Note: Ashampoo Snap 3 (latest version English setup installer is available for download) is also available free as part of Ashampoo free gifts promotion.